Paris School: The BEST place for kids! From K to 8, our school is great! 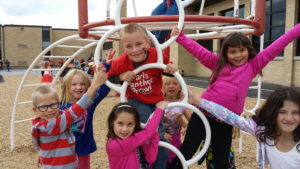 Paris Consolidated School District is an independent, superior achieving K-8 public school district located in Kenosha County, WI, just three miles west of I-94 off of Hwy. 142 on Hwy. D south. We are a small, country school with high standards and full hearts. Surrounded by peaceful countryside, our school building is bursting with Panther Pride. We care for each other here, believe in balance, and we say the Pledge. We help our students thrive–both academically and socially, celebrating their journey along the way. Paris students hold doors for adults, do their best work, and believe it’s cool to be smart. Our middle school lockers are lock-free, our co-curriculars bench-free, and our kids free to succeed! We invite you to learn more about our great school…and once you do, your family will want to be Panthers, too! Learn about our outstanding Advantages. Schedule a personal school tour.